[A]t Landaa Giraavaru, 34 new frames were transplanted in February, giving us a total of 2,052 frames around the island. 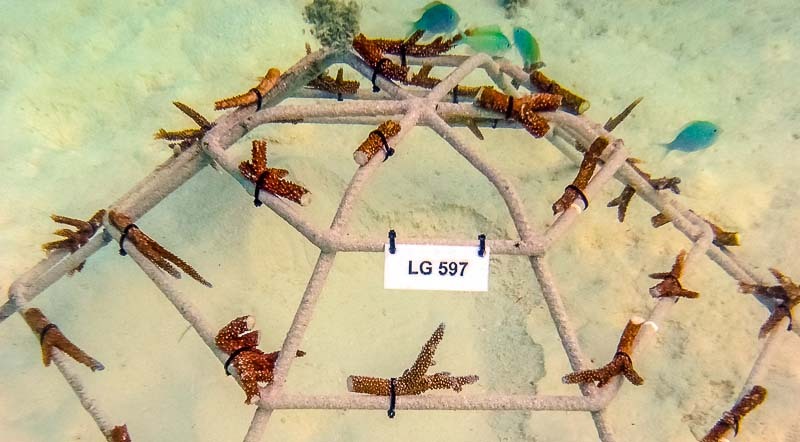 This month we also monitored and photographed a total of 466 frames, and are happy to report that our older frames (from October 2011) in the Landaa Estate area are flourishing, with the corals showing excellent growth rates and healthy colouration. The water temperatures this month have been averaging 28.5°C (normal for this time of year) which is good news for the corals and no significant bleaching has been observed. 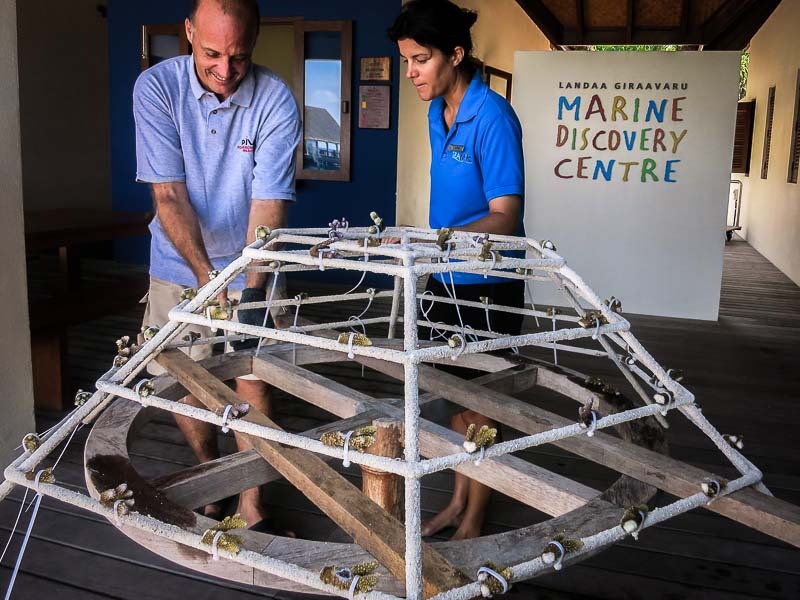 At Kuda Huraa, we transplanted 28 new frames this month and monitored and photographed a total of 203 existing frames around the lagoon. [L]ast month we began trying to grow Seriatopora hystrix (‘Birdsnest coral’) – a common species in the Indo-Pacific region but not often found here on neighbouring reefs. Unfortunately most of our fragments died off during the month, possibly due to the long period they were out of the water whilst we waited for the epoxy to dry. We also noticed that the Gobies in the tank were moving sand around whilst feeding, and this was settling onto the fragments on the lower bars. We are now trying a much quicker technique, and have simply attached the fragments to a rope which we then submerged into the tank. We will monitor how these fragments perform over the coming weeks and assess whether this is a possible method for growing Seriatopora hystrix on a larger scale in the future. [W]e are having better success with our experiments using two soft coral species: Sarcophyton (‘Mushroom coral’) and Lobophytum (‘Leather coral’). The challenge here is finding an effective method to attach the coral fragments to the rock substrate and we are experimenting with epoxy resin and ‘superglue’ (commonly used in aquaria). The fragments attached with superglue actually came free after a couple of weeks, but these then attached themselves naturally to the rocks. (At least this confirms we have good growing conditions in the tank). By contrast, the fragments attached with epoxy have remained in place and have started to grow over the resin, with a new stem forming. This is a promising result, so we hope to repeat the procedure with more fragments and then move them out to the Spa area to see how they survive in the lagoon. 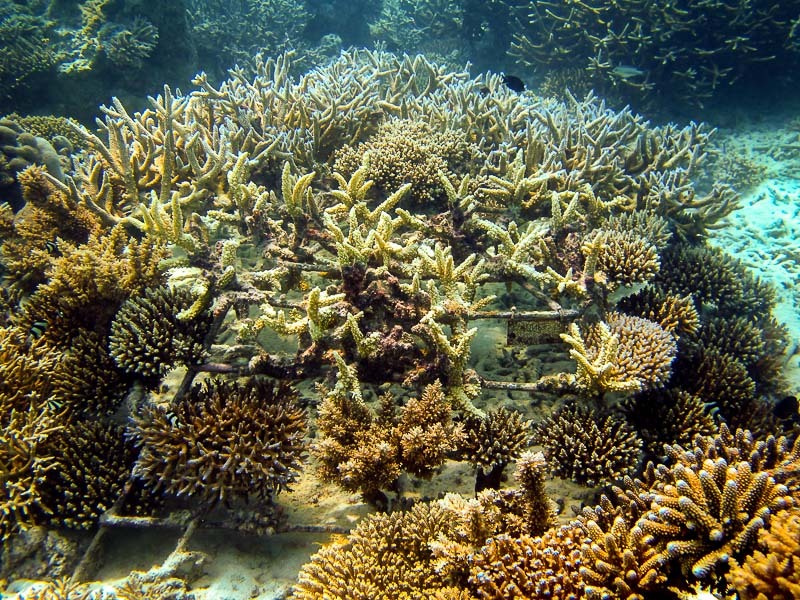 Coral frame LG487 was transplanted back in Dec-09, and is shown here 3 years later (photographed on 07-Feb-13). After several years of growth, the corals mature and become an integral part of the natural reef ecosystem. See how to sponsor and personalise your very own frame or check for updates to the Coral Frame Collection.